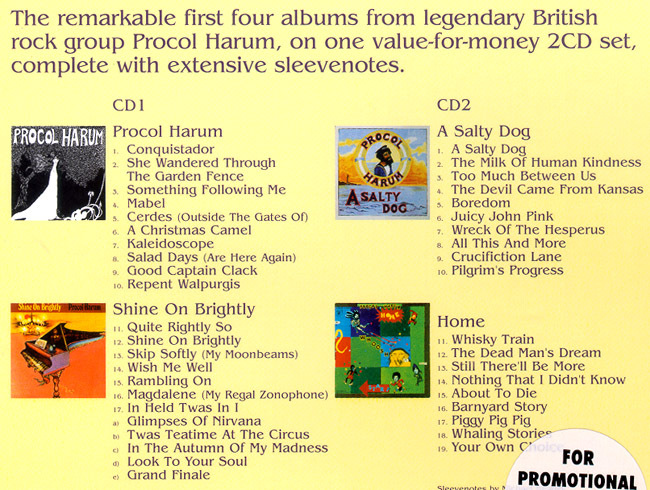 What can we say by way of a review of this new compilation, 'the remarkable first four albums from legendary British rock group Procol Harum, on one value-for-money 2CD set, complete with extensive sleeve-notes'? It looks good, it sounds great – and it doesn't contain a note of music that you have not already got! However if you want these albums for the car, or the office, or just as a backup; or to persuade all your friends and relatives that the stuff you've been obsessed by for 35 years really is worth listening to, it really cannot be bettered. The liner-notes are good too (see below) and – although they may have been carefully researched at BtP – we are not responsible for the idea at the start of the final paragraph! or Amazon UK will do the trick. Early pressings of this album omitted the title track from the third album A Salty Dog ... luckily the company realised the error before many copies had gone out. If you do happen to have a defective one, they assure us that you need only write in and it will be replaced. The year 1967 was a watershed period for rock. The Beatles showed what could be achieved on a 12-inch 'canvas' with Sgt Pepper, while at the same time delivering one of the era's greatest singles in Penny Lane/Strawberry Fields Forever. Yet even they had to concede top spot to Procol Harum's A Whiter Shade of Pale, the Bach-influenced ballad delivered by Gary Brooker which, by common consent, was Britain's prime contribution to the soundtrack of the Summer of Love. For the rest of their career, though, Procol would follow Sgt Pepper's lead and concentrate on producing albums of real quality. The first four are packaged here – and, though they've been made available many times since their 1968-70 release, they have more than survived the exposure. Not that Procol's début initially impressed: originally released as Procol Harum in January '68, it failed to chart at all thanks to including neither Whiter Shade nor its follow-up, Homburg, after all, the Beatles didn't put their singles on albums, did they? There was also the small matter of a six-month delay. Procol Harum had been recorded the previous June at London's Olympic Studios on the same kind of primitive four-track equipment as Sgt Pepper and finished in a matter of days, around half the songs having been recorded in one memorable marathon session. Yet it remained unreleased as producer Denny Cordell's company sought the best deal: so while the first single had been released by Deram, the album eventually emerged on Regal Zonophone. According to guitarist Robin Trower, the material "is the best Procol ever had ... if we'd had time to record that material with the imagination and love it deserved then it probably would have been one of the classic albums of all time." The band's American label were quick to title it after (and include) the hit, a shrewd move given Whiter Shade's Number 5 chart placing there. Some late-1960s critics compared Procol's unusual piano and organ line-up with Bob Dylan protégés the Band, whose Music From Big Pink was breaking new ground over the water. Pianist Gary Brooker supplied soulful lead vocals, while organist Matthew Fisher would go on to produce the group's third album before leaving to pursue a career the other side of the studio glass. David Knights was Procol's first bass player, while Robin Trower and BJ Wilson, on guitar and drums respectively, had previously played with Brooker in the Paramounts, Southend's answer to the Rolling Stones who, mere months before, had been pounding out basic, American-influenced R&B. Procol's first four long-players were all released on the previously mentioned Regal Zonophone label – hence the subtitle of Magdalene, a track from second album Shine on Brightly. But this sophomore LP, released in December 1968, is best remembered for the multi-song suite In Held 'Twas In I. Originally titled 'Magnum Harum', it has the flavour of a rock opera about it, and has been said to have influenced everything from the Who's Tommy to the second side of Abbey Road. Whatever, Procol themselves repeated the format with Whaling Stories (from fourth album Home, also included here) and 1977's The Worm And The Tree. Having been taken off the road in Britain early on and persuaded to seek their fortune in the States (where they'd impressed at the Miami Pop Festival in front of a six-figure crowd), Procol must have been happy with Shine On Brightly's Number 24 US chart position. Indeed, they commenced recording of opus number three in Los Angeles. But little of worth resulted from the session and they reconvened with Fisher producing at Abbey Road studios – the Beatles connection again! A Salty Dog emerged in the summer of 1969 and gave them a UK hit single with the haunting title track – the first of many orchestral collaborations. But by the time of the album's release both Knights and Fisher had departed. The band's format was making it difficult for all parties to obtain satisfaction – and it was the Brooker/Reid songs, delivered by the pianist, that represented Procol's trademark sound. "I think A Salty Dog is a most incredible song, one of those you say gosh, I wish I'd written that," conceded Fisher, who returned to the ranks in the early 1990s. "These days, if I want to write songs and sing them myself I can do that without being in the confines of Procol. I'm happy for Gary to do the singing 'cos he's the best singer!" Certainly, this third album exhibited an air of democracy, as evidenced by Robin Trower taking the lead vocal on his Crucifiction Lane and Fisher on Pilgrim's Progress and Wreck Of The Hesperus. Variety or unwelcome variation? You decide ... 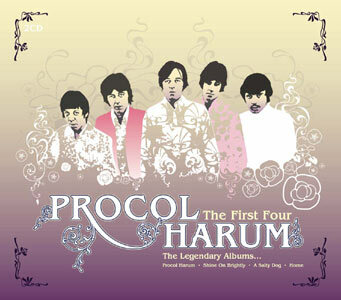 Yet, probably thanks to the success of the single, this became the first Procol album to chart higher at home (Number 27) than in the States (32). New arrival Chris Copping was an old friend from Paramounts days, who doubled on both organ and bass – and, having just graduated from Leicester University, added to Procol's 'cerebral' air. (Matthew Fisher, one of the men he replaced, later gained a master's degree in computer science at Cambridge). Copping featured on 1970's Home, an album which not unsurprisingly places less emphasis on organ. That gave Robin Trower more room to shine – and he took it. Whisky Train, a homage to Elvis Presley [sic] written with Keith Reid, underlined a burgeoning talent that would see the uncomplicated blues-based rock he'd purvey in a solo capacity from 1972 attract a bigger audience than the band he'd left. It wasn't that surprising, really: Procol's lifespan so far had seen the hedonistic 1960s give way to the heavy-metal 1970s, bands like Black Sabbath, Free and Led Zeppelin (plus a host of lesser imitators) purveying bluesy, riff-based fare a sight less psychedelic than 1967's top acts. Yet the band's timeless appeal would stand them in good long-term stead, even if they began to seem hopelessly unfashionable. Perhaps in reaction to that, they even declined to play their 'greatest hit'! Brooker and Fisher recently tried to define the appeal of an outfit that's variously been described as a classic rock group and a classical rock group. For Brooker, Procol Harum is "a soul and blues band which has these other influences ... it's just that, when we finally do it, it comes out differently." Matthew Fisher doesn't know what classic rock means, "... but one thing I don't like is when people start comparing us to the Moody Blues. I don't see we have anything in common. I'm not sure what kind of music the Moody Blues play, but we play rock'n'roll!" As Procol Harum moved to the Chrysalis label for the second phase of their career, beginning with 1971's Broken Barricades (Trower's last album), they left their early years – and some of their most distinguished musical moments – behind. But one was to come that very much leaned on the material gathered here. In Concert With The Edmonton Symphony Orchestra was the result of a Canadian collaboration that would become a Stateside Top 5 hit and spin off a successful single in a retread of first album track Conquistador. The catastrophe-ridden sessions outlined on the band's excellent website Beyond the Pale could fill a book, but against the odds yielded an excellent album. In Held 'Twas In I and Whaling Stories were other familiar highlights. But the story that had started so promisingly was destined to tail off in a welter of personnel changes: Procol lacked the strength to withstand the new wave and disbanded on the tenth anniversary of their breakthrough. "The book kind of shut itself," Brooker suggested. "We thought we'd got to the last page and the big, heavy back cover kinda flopped over! We didn't say we're packing in, we just went our separate ways in '77. It wasn't till years later, when the Internet was just starting, that I thought maybe we should try something else." Fans throughout the world used the web to find each other and convince the band to reconvene. After a number of false starts, the 2003 release of 12th album The Well's On Fire – with Brooker, Fisher and Reid all on board – has proved an appendix was well worth the writing. For now, though, let's enjoy the first four chapters of an unique and very British story. Michael Heatley is a feature writer with Classic Rock magazine who's somehow found time to write over 100 music-related books in-between interviewing everyone from Alice Cooper to Roger Daltrey. He once played bass with new-wave band the Beirut City Rollers before seeing the error of his ways, but still has his Fender and is open to offers!